You are browsing the Blog for bald eagle hatchling. Bald Eagle Essex County nest #1: nestling! 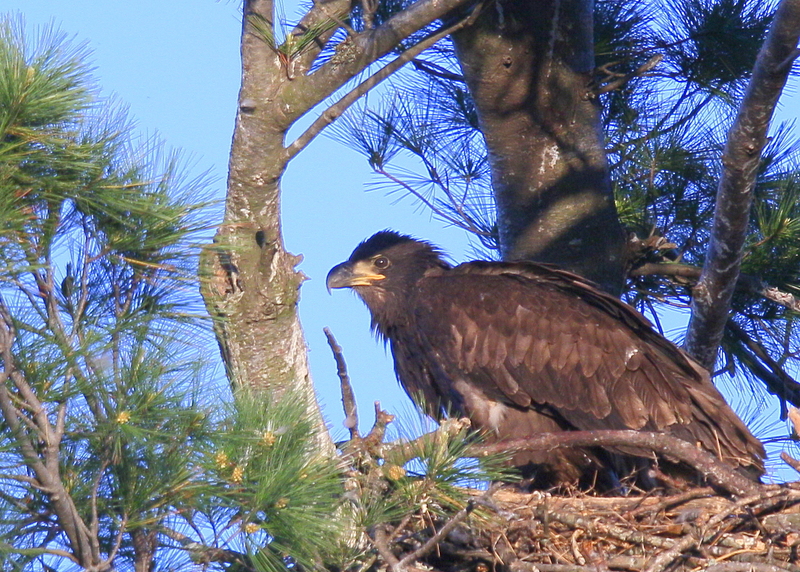 A late afternoon visit to Bald Eagle nest #1 in Essex county for nice looks at the young eagle nestling. Rough estimate that this young baby eagle is about 3-4 weeks old. No sign yet that there is another young bird in the nest. This was a moment when the adults were not in the nest and the the young nestling was up and about checking out the local surroundings! 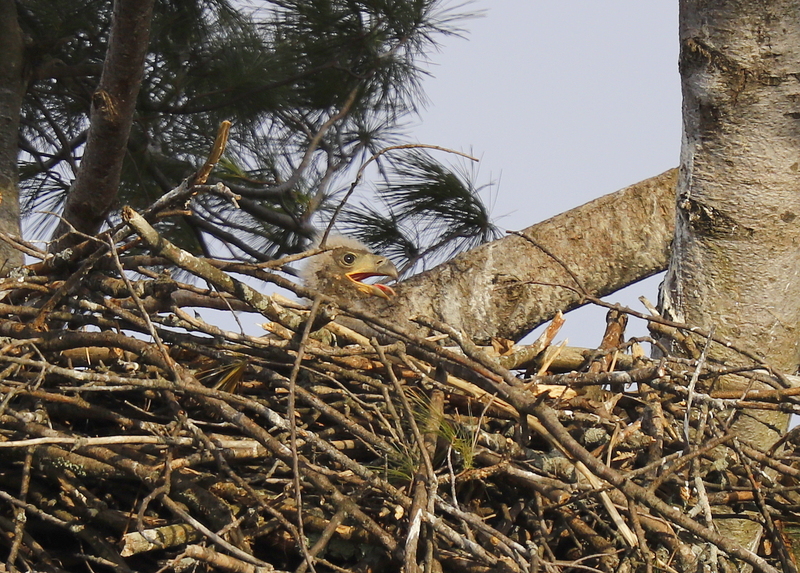 The nest in NW Essex County has two healthy eagle chicks this year. They are getting larger and are starting the wing flapping process as they move around the nest and move more frequently onto the ridge of the nest providing better views! As nestlings, eagles progress through three different sets of feathers including natal down, thermal down, and juvenile feathers. Chicks are hatched with a coat of natal down. This down is very light in color and does not have much insulating ability such that chicks must be brooded by an adult for warmth. Natal down is replaced by thermal down beginning around 10 days of age. Thermal down has very good insulating qualities and by 15 days chicks are typically able to thermoregulate on their own. The emergence of juvenile feathers including contour and flight feathers typically begins on or before 27 days. These dark feathers are arranged in tracts and emerge in sequence beginning with the capital (head) and dorsal (back) tracts. The ventral (belly) tract is the last feather group to emerge. Flight feathers including the wing and tail continue to grow throughout the development period reaching their maximum lengths around the time of fledging. The last phase of development as nestlings is neurological or the learning of coordinated movements. This includes walking, feeding, and flying. The final month of development is consumed by acquiring the coordination needed for movement and flight.